Once upon a time brands used to be in control. 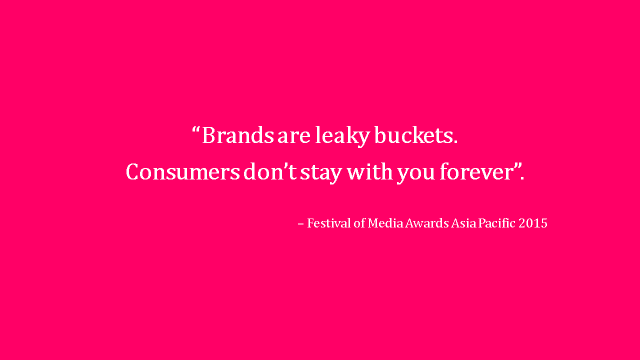 But happily-ever-afters are dwindling and brands are scrambling to tell stories. Consumers can now tragically end brand stories by skipping, unfollowing, or YELPing. Being great at content is not about the tactical wins on Twitter or successfully newsjacking news. Content is not one-off, it should be a sustainable solution that evolves with brand communications. Consumers now have the right tools to CREATE, TELL, and DISTRIBUTE accounts of their brand experiences. Whilst brands insist that they are THIS kind of brand, consumers find a way to define brands differently- with what? STORIES. There are a lot of great stories out there that have yet to be told greatly. Storytelling is living vicariously through consumer experiences so that more people could experience life with brands. Information is no longer the currency, stories are. It’s not the hunt for the cool, it’s the pursuit of the REAL. To tell a story, the brand must be a living and breathing core that fuels the creation of more stories. The new language is art and if brands don’t communicate with respect for aesthetics and authenticity, then consumers will not be engaged. You don’t have to tell stories on your own. That’s why artists, writers, poets, tastemakers exist for they have a higher calling to create and curate beautiful things. That’s why Kanye West is no longer just a rapper (see DONDA). Is crowdsourcing the answer? It’s risky for it invites all kinds of responses and if you filter it, it backfires. A more proactive solution is to create an open platform of inspiration where quality creators will be enticed to create, co-create, and share their work. For example, Joseph Gordon Levitt’s brainchild- HITRECORD. It has become so successful that made-for-TV episodes on Pivot are done through collaborations with artists across the globe with just one theme cascaded by JGL. The Storytelling System has three key players – The Stories (client), The Raconteurs, and the Inspirers. There is a constant creation and distribution of stories told in images, words, films, etc. These stories are then distributed to inspirers or tastemakers signaled by a LAUNCH but artists can continue to enhance the existing projects. Set up your publishing/content platform that enables story creation. 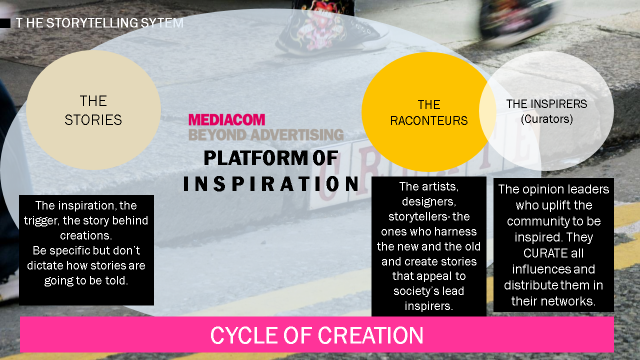 MEDIACOM BEYOND ADVERTISING specializes in designing Storytelling Systems (Content Strategy, Creation, and Distribution) that enables the cycle of creation by creative and authentic artists who also happen to be your consumers. And this is where we take brands beyond traditional, beyond advertising, beyond just cascading information. Because to become a PUBLISHER, you must be a STORYTELLER. And you better be a bloody good one. Jox is a Content Strategist & Storyteller who thrives in integrating brand promises with everyday human stories. She lives vicariously through media and content- ads, viral videos, haiku apps, and blogs. She lives and breathes art to fuel her passion in marketing brands.